Introduction: An Android percentage chart that displays the progress of any single given task or information. Please feel free to see the library in action in a showcase app available on Google play. This will help you check if a certain design can be achieved. pcv_mode enum pie - Sets percentage chart appearance to "ring", "pie", or "fill". 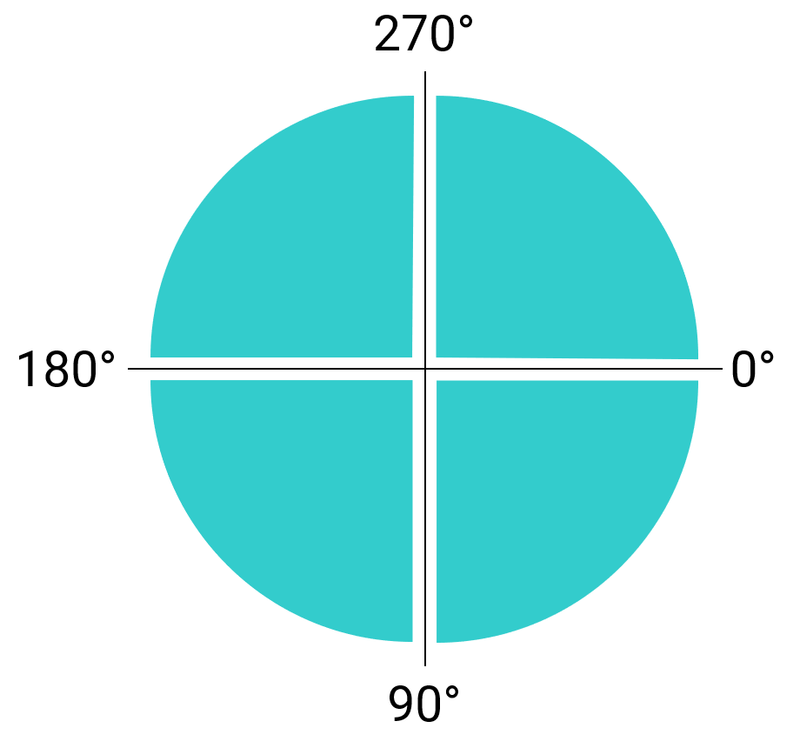 pcv_orientation enum clockwise Pie, Ring Sets progress's drawing direction to "clockwise" or "counter_clockwise". pcv_startAngle integer 0 All Sets progress's drawing start angle to [0..360]. pcv_animDuration integer 400 All Sets progress update's animation duration. pcv_animInterpolator enum linear All Sets progress update's animation interpolator to "linear", "accelerate", "decelerate", "accelerate_decelerate", "anticipate", "overshoot", "anticipate_overshoot", "bounce", "fast_out_linear_in", "fast_out_slow_in", "linear_out_slow_in". false for ring mode All Sets whether to draw background or not. pcv_backgroundColor color #000000 All Sets background color. pcv_progress integer 0 All Sets current progress. pcv_progressColor color Accent color All Sets progress color. pcv_textColor color #ffffff All Sets text color. pcv_textSize dimension #12sp All Sets text size in SP. pcv_typeface string System font All Sets progress text's typeface file path in assets folder. pcv_textStyle flag normal All Sets progress text's style to "normal", "bold", "italic", **`"bold\ italic"`**. pcv_textShadowColor color #00ffffff All Sets text shadow/glow color. pcv_textShadowRadius string 0 All Sets text shadow/glow radius. pcv_textShadowDistX float 0 All Sets text shadow/glow's x-axis distance. pcv_textShadowDistY float 0 All Sets text shadow/glow's y-axis distance. pcv_backgroundOffset dimension 0dp Pie, Fill Sets a margin only for background. pcv_drawBackgroundBar boolean true Ring Sets whether to draw background bar or not. pcv_backgroundBarThickness dimension 16dp Ring Sets background bar's thickness in DP. pcv_backgroundBarColor color #000000 Ring Sets background color. pcv_progressBarThickness dimension 16dp Ring Sets progress bar's thickness in DP. pcv_progressBarStyle enum round Ring Sets progress bar's style to "round" or "square". pcv_gradientColors string - All Sets the gradient colors for progress in a comma separated hex color values format; "#F44336 , #2196F3 , #00BCD4". pcv_gradientDistributions string - All Sets the gradient colors' distribution in a comma separated float values format; "0.2 , 0.5 , 0.8". Values must be monotonic and belong to [0..1]. If ignored colors will be distributed evenly. pcv_gradientAngle integer pcv_startAngle All Sets linear gradient colors' drawing angle to [0..360]. pcv_startAngle and pcv_gradientAngle attributes accepts values following the next illustration. All XML attributes have their Java counterparts except the pcv_mode attribute (for now). Updates can be set by making the changes and calling apply(). This will make sure to redraw the view only once at the end. For a single update, you can call the needed setter method. e.g. setTextSize(sizeSp). To use the color per progress feature, you have to pass an AdaptiveColorProvider class using the setAdaptiveColorProvider() method. Adaptive colors can be applied to progress, background, text, and background bar. It's worth mentioning that gradient colors have a higher priority than the provided colors, and that you can ignore redefining the methods you don't need as they have an implementation by default. //This will provide a bg color that is 80% darker than progress color. It's possible to get progress updates by setting an OnProgressChangeListener. For text, you can use another unit instead of percentage. You have to pass a ProgressTextFormatter class using the setTextFormatter() method. All bugs, feature requests, feedback, etc. are welcome. Please, feel free to create an issue. You can contribute by opening pull requests on dev branch. Please try to push commits per feature for a clean commit history. Are you using this library in your app? Let us know and we'll show it here.